One of our most popular rose-themed wedding favors! Add the unmistakable elegance and beauty of white roses to your event with these exquisite candle favors! We wrap a 2 1/2" by 3" clear glass votive in textured white paper, then add a pair of cloth white rose blooms with green stems and leaves, tied to the front of each favor with a white organza bow. The candle holder includes a white tealight and arrives packaged in a clear gift box with white organza ribbon and rose themed "For You" tag. Our white rose candle favors can also be used to decorate your reception tables! Can you do where the roses are red? This Rose Candle favor is only available in white, we don't have it in red I'm sorry. I'm sorry, we're not finding an order for you on our site with your name or email. The order number you provided is not ours; our order numbers always start with "180". Please email us at [email protected] with your destination zip code and we can look into it further, if needed. 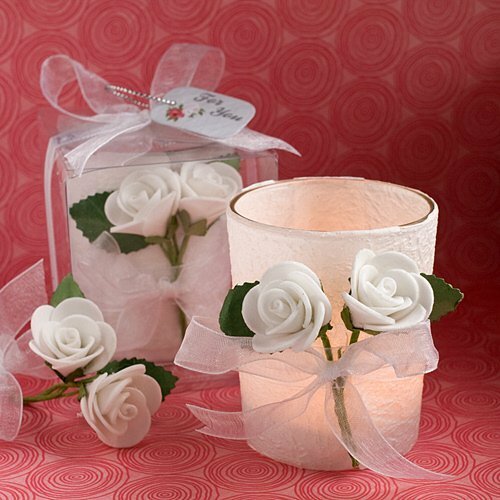 The White Rose Candle Favor also includes a white tealight and arrives packaged in a clear gift box with white organza ribbon and rose themed "For You" tag. 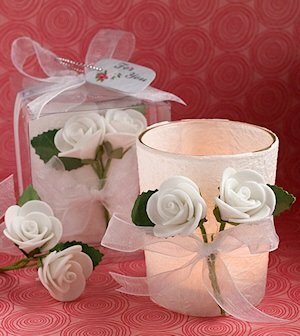 Do these white rose candle favors come with a gift box included with a ribbon and tag? Yes, the White Rose Candle Favors are packaged in a clear gift box with a white organza ribbon and a rose themed "For You" tag as pictured.